Sony's last year flagship, the Xperia XZ1 Compact is now on sale in the United States for a price that many would consider a steal. It's one of the few times that the smartphone's price drops below $400, as far as we know. 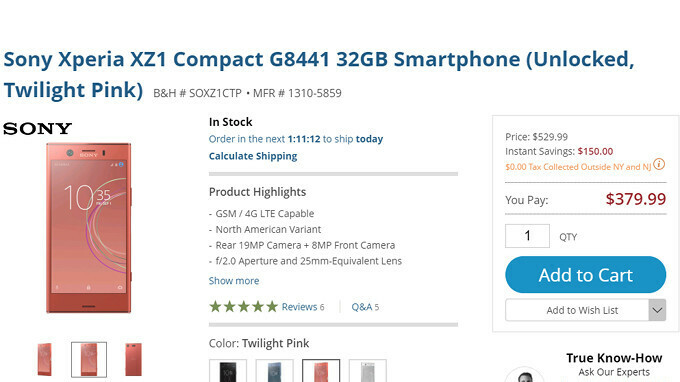 US retailer B&H Video now offers the smartphone for just $380, down from $530 (according to the seller). However, you can find the Xperia XZ1 Compact for $500 outright at many retailers across the country, but that's still a $120 discount. The only catch is the deal is only available for the Twilight Pink version of the Xperia XZ1 Compact. The other color options – Black, Horizon Blue, and White Silver are on sale as well, but for a slightly higher price than the pink model. It's also worth mentioning that the smartphone comes unlocked, but it will only work on GSM carriers in the US like AT&T and T-Mobile, so don't buy it if you use Verizon or Sprint. The ad says XZ1 Compact. Yuk! One of the ugliest phone ever made. Whoever we this article needs to open their eyes. It's the XZ1 compact not the XZ1. Still a great deal though. I have one and I love it. Best Buy has it for $399, and can get it in black, not just that yucky salmon color.